An intensely radioactive element, radium is an alkaline earth metal that is found in trace amounts in uranium ores. 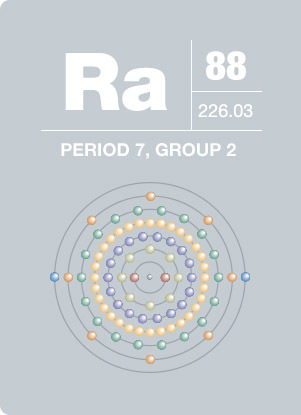 Its most stable isotope, 226Ra, has a half-life of 1602 years and decays into radon gas. Radium emits alpha, beta and gamma rays and when mixed with beryllium produces neutrons. Inhalation, injection, or body exposure to radium can cause cancer and other body disorders. In the early 20th century, radium was used to paint watch dials and hands due to its luminescent qualities. The dial painters, mostly women in their early twenties, were some of the first victims of radioactive poisoning.